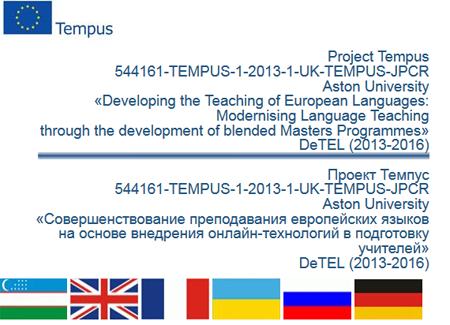 Voronezh State University as part of a consortium of 10 universities was awarded a grant in the framework of the Tempus Programme (Trans-European Cooperation Scheme for Higher Education) and entered the Tempus project «Improving the teaching of European languages ​​through the introduction of on-line technologies in teacher training» (544161-TEMPUS-1-2013-1-UK-TEMPUS-JPCR Aston University « Developing the Teaching of European Languages: Modernising Language Teaching through the development of blended Masters Programmes »). The Faculty of Romance and Germanic Philology of Voronezh University became the key unit of the project. The project focuses on improving the learning and teaching of European languages in the participating countries by adopting a cascade model of teacher education for long-term sustainability. The cascade model will enable larger groups of school teachers to be trained in a relatively short time with minimal resources and will allow schools to prepare learners for the requirements of HEIs in the framework of the on-going reforms of education in these countries aimed at internationalisation. The central activity is therefore the development of a master’s programme for current and prospective teachers of European languages (English, French and German). The master’s programme, provisionally MA in Modern European Language Teaching (MELT), will introduce innovative learner-centred methodologies tuned to the EU standards. However, special attention will be given to adapting programme content to the needs of the local context where appropriate. The project will be based on collaborative development and initial delivery of the MA with a gradual handover to trainers in the partner-countries, making delivery fully sustainable beyond the life of the project.